Our entertaining mobile party hosts will travel to any venue of your choice in Sydney or book a catered for party at our venue in Thornleigh. Popular party themes include: Generic Parties, Minecraft parties, Star Wars Parties, Friends and Ninjago themed parties. Make your Corporate Family Christmas Party one to remember! With Christmas themed LEGO® Building, Creative Play zone, DUPLO Soft play area for toddlers! We’ve got you covered for fun a fun and colourful activity for all ages at your Corporate Family Christmas Party or Bring your kids to work day. 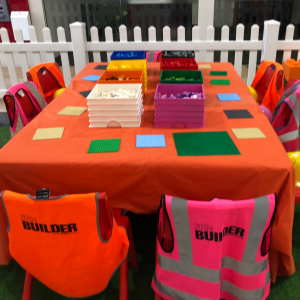 Invite Little Builders to your shopping centre in the school holidays and your shoppers and their children will be thrilled with what we have to offer! Learn more about what we can offer your centre today…. EASY venue with catering option for your hosted party in Thornleigh. 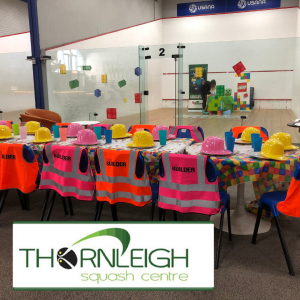 The venue is very flexible with a licensed bar, fully equipment kitchen, ample parking and squash courts & ping pong table available for the parents to use at no extra charge whilst the Little Builders are happily entertained! Have an easy fully catered for party at our venue partner – MAGPIES Waitara! Large and private function room available for all Little Builder parties with great food and drink options available. We don’t just run parties! We love to organise a fun events. 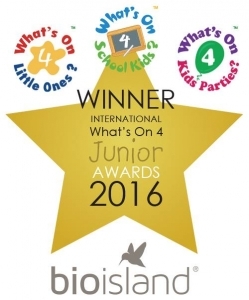 Little Builders is proud to be winners in the 2016 What’s on 4 Kids Awards and Finalists in 2015! 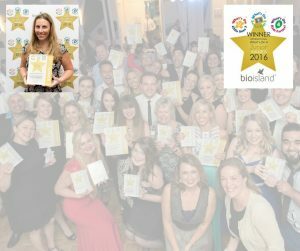 We couldn’t have done it without your support! THANK YOU! Check out links to decoration ideas, print outs, craft ideas, cake suggestions and more! 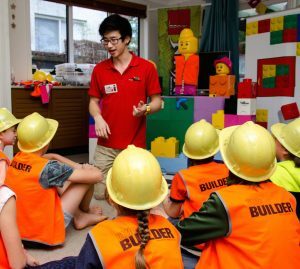 Building parties for Sydney’s Little Builders since 2013! 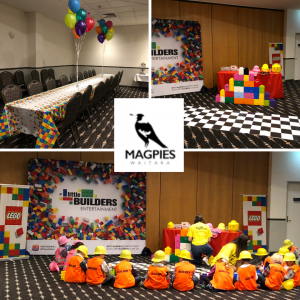 Little Builders have provided hundreds of LEGO® brick themed birthday parties to children and their friends ranging from 3 to 10 year-olds, but if you are 40 and want a LEGO® brick themed birthday party, don’t let that stop you! Your Little Builders will have so much fun being challenged and encouraged to use their creativity. lease the party kit yourselves for only $220 inc gst! ! 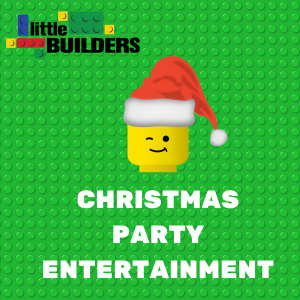 Whichever option or package you choose, your party will include a fantastic display of LEGO® brick equipment and enough games and challenges to keep your little builders thoroughly entertained! Once you have taken a booking, you will be in good hands, with a personal and professional service from the time of booking through to follow up after your party. 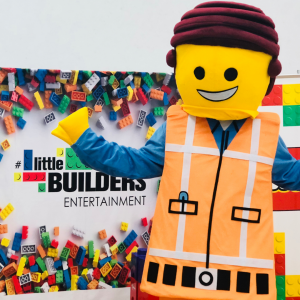 Take a look at our testimonials and reviews page to see what our clients have to say about Little Builders parties. Please fill out our Party Enquiry Form to make an enquiry. Claudine, Just want to express how happy we were with your service for Connor’s 6th Birthday Party. Matt was the perfect host and absolutely wonderful with the kids. They were entertained and engaged for the entire session. The kids had a ball, they loved the Tower competition and in particular building their own race cars and of course the Lego Grand Prix !! So glad we booked you for Connor’s birthday, a great time was had by all – even the parents!! I would recommend you to anyone asking, great communication from your team making it easy to book, sent helpful links for theming, you and Matt were a delight to deal with at every moment. Yesterday Kieran hosted our son Sammy’s Star Wars Lego party for his 5th birthday! The party was brilliant!! He arrived in plenty of time set up and organise and did a brilliant job keeping the kids engaged and happy! They really do take care of everything and great for the parents too as we could sit back and enjoy! Highly, highly recommended and I will definitely do this again!! Thanks Claudine, Kieran and all the team at Little Builders!! We had my sons 8th birthday party at home and had Wendy as the host. Wow! Wendy was the best host! The whole time the kids were entertained. Harper’s grandpa couldn’t believe how quiet the kids were. The display looked fantastic and everything was so organised. Thank you and i would highly recommend Little Builders. Thank you so much James and Edward for an amazing party! My 2 birthday boys and their friends had a wonderful time. You were both great with the kids and somehow managed to keep a room full of boys engaged and thoroughly entertained. We will definitely recommend you to anyone looking for a unique and fun party experience. Thanks again! Lydia was amazing, awesome set up and the kids had a fantastic time! They were entertained from start to end, and loved all the activities that Lydia arranged. The decorations and lego were bright and colourful and Danny and his friends were so excited. Lydia is very good at keeping the kids attention and is very patient and great with children! Thank you so much for a wonderful time! Just wanted to thank Claudine and the team from Little Builders for the fabulous 9th birthday party for my son Luke at the weekend! 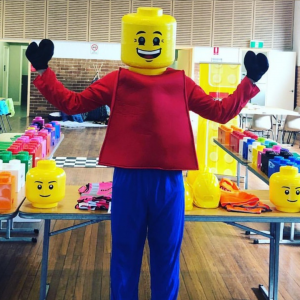 Steven was our party host and he was terrific – arrived on time, efficiently setup the incredible lego display, never stopped smiling the entire time and delighted my son and his friends with the lego activities! Would definitely recommend to other families, we had a wonderful time, thank you Little Builders!